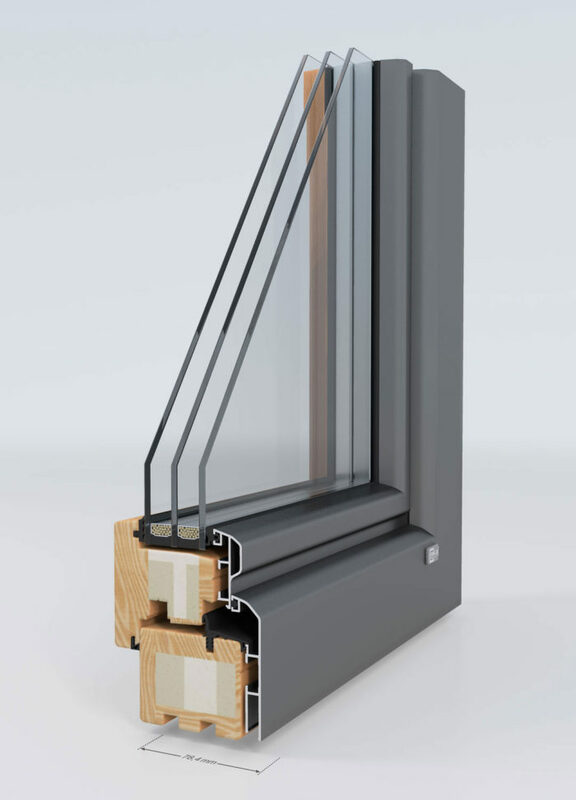 A triple-glazed Unilux UltraTherm window. Woe are we with windows! We started seriously exploring window options in June. Two months later, we are STILL hung-up on windows. Not so with us. Window features, colors, grilles and other options are irrelevant; it’s all about the performance specifications of the window, specifically: glazing U-factor; sash and frame U-factors and dimensions; glazing Solar Heat Gain Coefficient; and glazing Visible Transmission. These are the critical elements in meeting the Passive House standard. The south-facing windows have to let more heat into the house during the day than is allowed to escape at night. As we are finding, there are few windows on the market that can measure up to this daunting task. After we rejected Pella (inadequate performance) and SchÃ¼co (quality and reliability concerns), we began to look at Unilux UltraTherm 3 and Thermotech 322 series windows. I will discuss the Unilux windows in this blog. We went to see installed Unilux Ultratherm 3 windows in early August. The windows are locally marketed by Hancock Lumber, a sixth-generation family-owned building supply and land company in Maine. 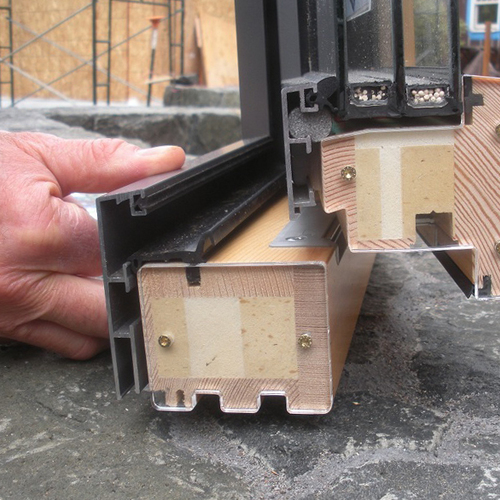 This is a triple-pane, gas-filled window, low-e coating on two sides, and a sash and frame core composed of a “homogeneous combination of wood and highly insulating basic materials, sometimes harder than wood, molded by applying 20,000 volts” (of electricity). 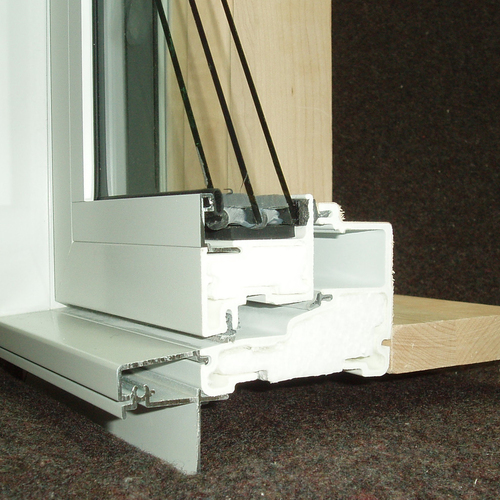 This composite core provides a critical thermal break within the frame and sash members. 1 – The Unilux sales support from Hancock Lumber has been underwhelming. This is particularly troublesome for such a premium window, with associated premium price. If responsiveness is this challenging before a sale, what can we expect after the sale? It typically takes one to two weeks’ turnaround to get questions answered, whether the queries are related to technical, installation, options, features, or pricing. This cannot reasonably be due to time zone differences or a language barrier. In desperation, our architect, Chris Briley, opted on several occasions to bypass the Hancock team and posed questions via e-mail directly to the manufacturer in Germany. He used Google to translate the text into German before launching the e-mail at the end of the day. He had a concise reply, translated into English, awaiting him the next morning when he arrived at work. When other Hancock responses do arrive, they include a manufacturer’s printout with undecipherable product codes and no reliable or easy way to compare what was specified, and what was provided. There have been numerous errors on glazing types and window sizes from what was specified, thus requiring a re-work, and another extended delay. Fundamentally, it is not clear that the Hancock team understands our window performance needs, or how the Unilux product and all its permutations can best meet that need. For example, a few weeks ago Chris realized that Unilux could provide a “curtain-wall” window, which assembles multiple individual windows into a larger single unit, eliminating redundant frame members. This substantially increases the performance of the windows because there is more higher performance glazing and less lower performing wooden frame in the same size unit. The Hancock team never proposed this option for our large expanse of south-facing windows. We have been awaiting the Hancock team to provide us with a curtain-wall proposal including price for the south-facing windows for nearly two weeks. But there is another hitch. Unilux requires that the curtain-wall be installed by an individual certified to do so, or the windows lose warranty coverage. Chris was advised that Hancock has no certified installers, nor do they have access to anyone that is certified. I find it puzzling for a supplier to sell a premium product without being able to deliver the full ranges of services for that product. There appears to be another previously unknown option according to the Hancock team – “direct glazing,” which similarly eliminates some sash members. While confirming that this might be an option, no performance specifications were provided. Ugh! 2 – The Hancock team has failed to answer the few simple questions I have personally asked directly to them when I met them at Unilux window job site in early August. For example, I have yet to receive an answer as to what the cost difference is between double- pane and triple-pane windows for the three-season room. 3 – Absent the use of a curtain-wall along the south facade, the Ultratherm 3 windows as currently specified fail to achieve the Passive House standard without additional substantial increases in insulation. The results of Marc Rosenbaum, our energy consultant, were shocking, given the UltraTherm 3 product literature. The reason is that the sash and frame members of the Ultratherm windows are thicker and have a lower SHGC than the SchÃ¼co. The Passive House heat load ceiling is 4.75 KBTU/sf/yr. The SchÃ¼co windows comfortably met the goal at 4.40 KBTU.sf/yr. Without any other building envelope changes, the UltraTherm 3 came in at 6.35 KBTU/sf/yr. The German Unilux rep did offer to substitute non-standard, higher SHGC glazing, but that strikes me as both more expensive and ill-advised to go outside the manufacturer’s comfort zone for our tiny EdgewaterHaus. 4 – At a price approaching nearly $70,000, the UltraTherm 3 windows cost $134 per square foot, a princely sum. In fairness, I suspect there are extenuating circumstances at Hancock Lumber. Chris has admittedly cycled the Hancock team a number of times for pricing, sizing, and performance factors as the EdgewaterHaus design has evolved, driven not by floor plan changes, but attempts to get the right amounts of south glazing in the right architecturally pleasing form to meet the Passive House standard. Unilux is a recent addition to the Hancock line of windows, and when asked for installed examples, only two locations were provided. We can only ponder whether the Unilux ordering system is overly cumbersome. The Hancock staff has yet mastered all aspects of this line of windows. Hancock lumber has a sterling reputation in the area. We hope we can quickly overcome these hurdles. In the meantime, we are delaying the start of construction, because the building envelop is not finalized, because we have not yet come to closure on window selection. Stay tuned for a blog on the Thermotech windows. Ordering windows should not be this hard, nor take this long. Write your email in english, then translate it into german, then translate it back again. repeat until the version that comes back makes sense. What will trip up a non english speaker is idiom, this process clears this out. We have a project in Vermont under construction with Unilux windows (which haven't arrived yet from overseas) and we dealt with New England fenestration - http://www.newenglandfenestration.com/ They were very responsive and helpful. This ongoing window saga.... Why not simplify, go PGH, add PV to make up the difference along with a split air unit. PGH net zero might be achieved with less carbon footprint, less frustration, less cost, and less pressure on suppliers and decision makers. I'd also like to see the architect and builder make a living per hour of work including all the choice and meeting and research and re-meeting and re-researching and re-redesigning. Thousands of PH homes are built. They have windows. Decision making. Can you afford a perfect PH window package including certifying an installer? If this was my project I would travel to wherever, get certified, and measure actual windows BEFORE designing rough openings. Nothing is worse than changing all ROs after the fact. Lastly, seems like quite a few chefs in the kitchen. Collaboration is an interesting well used fancy word these days in the blogosphere. My bet is that soon you will be back on track and have great windows ordered. The long and short is that the author suggests that getting the "best" windows may be a waste of $$, in a net zero house, I'm not sure if its relevant for a passivehaus but it was an interesting and thoughtful read. I distribute Drewexim windows & doors http://www.drewexim.com here in New England, mostly in Maine/NH/VT. Hancock Lumber's Unilux product is my direct competitor, so I can't say I don't enjoy just an ounce of these findings. But, I will say in defense of my fellow distributors that Chris Briley contacted me nearly a year and a half ago about this project...and they still haven't selected a window yet? In this business, I have found that you are forced to weed through the tire kickers and try your best to distribute your time as best you can. While I don't blame the customer with being frustrated at not getting answers to direct questions, a salesman/distributor does not get paid for analysis, quotes, sample-fetching, and all of the help/assistance given to a customer...only to find them going to your closest competitor, for example. With that said, give me a call :) Our pricing is always lower than Unilux, and I'll tell you in less than 48 hours if I can give you what you need because I do indeed now my product inside & out...and I'm not selling 10 different window brands. Pricing & information does flow slowly these days, so I understand the 1-2 week turnaround on some custom questions. 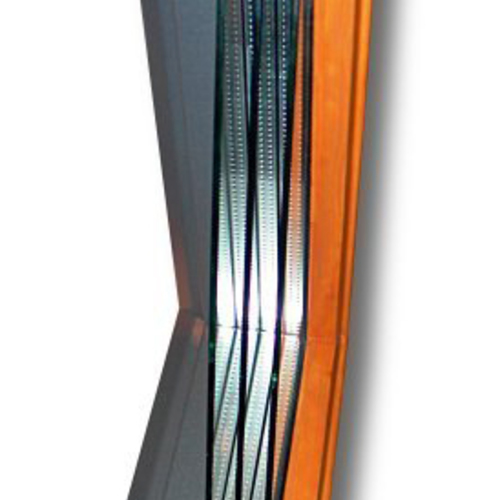 But unless you are using electric liquid crystal glazing (which I am) or a marine grade finish on aluminum that give a 30 year warranty (which I quoted), or are using the only 4-wide GU electric Lift-slide operator in the US (which I did), answers should flow faster than what they're experiencing. Had to toot my own horn there, sorry. Reading articles like this about my competitor only makes me shake my head. to the Normands of the world, you are are correct: it shouldn't be this difficult....and it isn't. Best of luck on their PH. 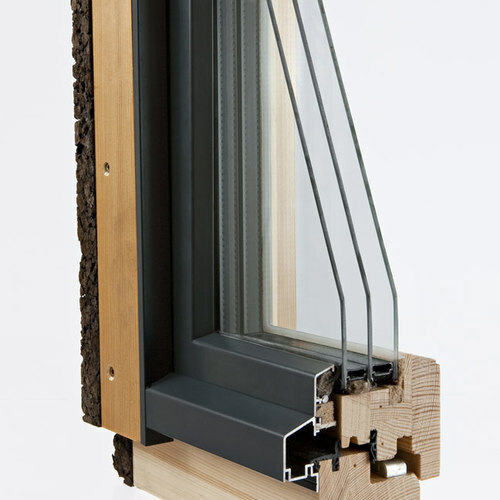 Intus windows provides a product that is certified by the Passive House Institute in Germany. Intus has been in the U.S. for 2 years and has several projects completed and in process. The certified window is u-0.107. They also have 2 other product lines that can help achieve Passive House certification, but have not been certified by the Institute. Note that I am a distributor for Intus and for a reason. The performance, quality and aesthetic are all phenomenal. Tolstoy has a story: Six Feet of the Country. A would-be homesteader strives to run around the biggest area of land he can in a single day and thus lay claim to his new farm. Setting his sights too large he collapses and dies of exhaustion before he can close the loop: his grave is the only plot he finally wins, hence the title. Relevance? Someone needs to say it: if you're looking at curtain wall glazing in a PH to gain a few decimals on the U-factor, it sounds like your fenestration ratio is wildly overambitious and you may be setting yourself up for failure. I've never designed a Passivhaus so maybe should keep my mouth shut, but all the ones I've seen have quite modest amounts of glass. How about substituting (MUCH higher-R value) wall for window instead of killing your budget on the window spec? I'm beginning to get calls from manufacturers, distributors and friends who are astounded that we are STILL looking at windows. While the process took an exceptionally long time, I wanted to point out that Roger's blogs are excerpts from his own blog at edgewaterhaus dot com. These were written some time ago. GBA has become interested in the project and Roger's willingness and adeptness to share every detail of the process of building this passivhaus. So they have asked him to share excerpts of his blog on this well established and wider forum. I hesitated to write this because I didn't want anyone to refrain from chiming in because they feel this is old news, but then I remembered who I'm dealing with here. You are the knowledge seekers and sharers; Those who wish to improve their own buildings as well as their own built environment. My hat is off to Roger, GBA, and everyone who seeks passivhaus knowledge. There is now a North American option for PH windows. EuroLine Windows Inc. is the largest manufacturer of tilt and turn windows in North America and has recently launched it's 4700 series. The line consists of a UPVC/fibreglass, Passive House Institut certified frame from Rehau and Cardinal 180 glazing with a Flexfoam Superspacer. We have selected them to provide the doors and windows for our PH project and are pleased to have domestic expertise, manufacturing, installation and warranty service. Their website is: http://www.euroline-windows.com. The project website is: http://www.bernhardtpassive.com.